Challah is a loaf of yeast-risen egg bread that is traditionally eaten by Jews on Shabbat, some holidays, and on special occasions, like a wedding or ​brit milah (circumcision). ... When you enter the land where I bring you, it shall be that when you eat of the bread of the land, you shall set aside a portion for God. Of the first of your dough you shall set aside a loaf as an offering; as the offering of the threshing-floor, so you shall set it aside. From the first portion of your dough (challah) you shall give to God an offering throughout your generations. From this verse comes the practice of separating a portion of the . In reality, any bread that is made with one of the five grains (wheat, barley, spelt, oat, rye) falls under the category of challah and requires the blessings for bread, whether it's sandwich bread or a bagel. But on Shabbat, special holidays, and special occasions, bread is specifically called challah and takes special shapes, forms, and styles. Challah is traditionally braided using anywhere between three to six strands of dough. According to author Gil Marks, until the 15th century, most Ashkenazim (Jews of Eastern European descent) used their rectangular or round weekday loaves for Shabbat. Eventually, however, German Jews began making a "new form of Sabbath bread, an oval, braided loaf modeled on a popular Teutonic bread." Over time this shape became the most commonly used in Ashkenazic culture, though many Middle Eastern and Sephardic communities today still use either a round flat bread or plain rectangular loaves for their challot. "As hovering birds, so will the Lord of hosts shield Jerusalem." When eaten during the meal before Yom Kippur, a bird shape can also represent the idea that one's prayers will soar to heaven. During Passover, Jews don't consume any leavened bread or other food, and eat matzah (unleavened bread). For the first Shabbat after Passover, many Jews traditionally make shlissel challah, which is made in the shape of a key or with a key baked inside (shlissel is Yiddish for key). Seeds (poppy, sesame, coriander) are sometimes sprinkled on challot just before baking. Some say the seeds symbolize the manna that fell from heaven while the Israelites wandered in the desert following their Exodus from Egypt. Sweeteners like honey can also be added to loaves, likewise representing the sweetness of manna. Two loaves of challah (challot) are placed on the Sabbath and holiday table. Two loaves are used in commemoration of the double portion of manna that was provided on Friday to the Israelites in the desert following the Exodus from Egypt (Exodus 16:4-30). The two loaves remind Jews that God will provide for their material needs, especially if they refrain from working on the Sabbath day. The loaves are usually covered with a decorative cloth (called a challah cover), which is reminiscent of layers of dew protected the manna that fell from the sky. Baruch atah Adonai, Eloheinu Melech ha'olam, ha'motzi lechem min ha'aretz. 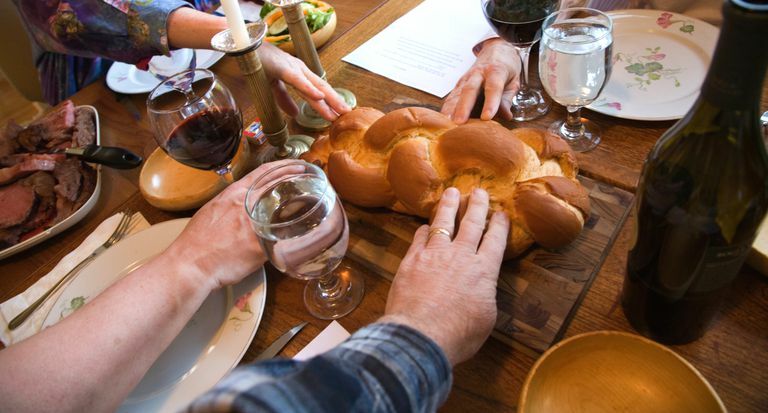 Following the blessing, the challah can either be sliced with a knife or broken apart by hand and traditions vary from community to community and even within families. Pieces of the bread are then distributed for all to eat. In some Sephardic communities, the pieces of bread are tossed instead of handed to people in order to show that all sustenance ultimately comes from God, not man. There are countless different traditions for how many loaves are used on Shabbat, with some communities using 12 loaves of challah laid out in unique patterns to represent the 12 tribes. The piece of dough that is separated before baking is in memory of the portion of dough that was set aside as a tithe for the Jewish priests (Kohanim) during the times of the Torah and the Holy Temples in Jerusalem.